The Wind Challenger Project which was started in 2009 by the University Tokyo and the JIP includes NYK Line, Mitsui O.S.K. Lines, Ltd., Oshima Shipbuilding Co., Ltd., TADANO Ltd., ClassNK and TOKYO KEIKI INC. The vessel is equipped with extraordinary large rigid sails (Height:50m, Breadth:20m, Thick:4m, Area:1,000m2) on the upper deck as a main propulsor which is made by advanced light material such as CFRP composite or Aluminum Alloy. This rigid sail whose horizontal section is crescent shape has a retractable steel spar and totally enclosed wing of composite material, and also has a vertically telescopic reefing and self-rotating mechanism to meet the wind velocity and direction. 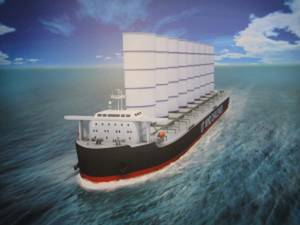 The four pieces of rigid sails (total sail area 4,000m2) are expected to generate forward thrust enough to drive 84,000DWT Bulk Carrier at the cruising speed of 14knot. The power management system between sails and a Diesel engine is also studied in order to save fuel consumption of the vessel at the hybrid operation mode.